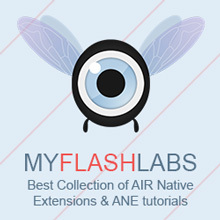 Air Native Extensions for Android plataform. Native extension that gives access to the Google Firebase project in Adobe Air projects supported on both Android and iOS with 100% identical ActionScript API…. Native extension to use OUYA services. It provides developers with a set of useful methods to customize the gameplay sessions and allow in-app purchases, for instance…. NativeAndroidLogger is native extension that allows applications to send AIR logs to Android LoCat. While developing Android apps, a developer often needs to inspect the logs to find a problem or a bug….